The waters around the island of Zirje and Kornati archipelago offer some of the richest fishing grounds in the Croatia with an abundance of big game fish. This fisherman's paradise provide a diversity of fish species for year round sport fishing, such as bluefin tuna, albacore tuna, swordfish, tresher shark, blue shark, amberjacks, etc.. This is not only the richest area for big game fishing in the Adriatic, but also the one closest to the shore. To see detailed map of the area, click map on the left. To see nautical chart of the area, click here. To see satelite view click here. 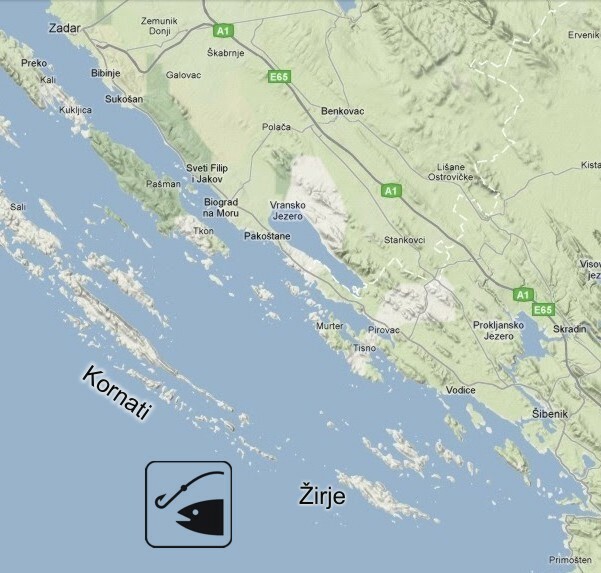 The Kornati archipelago is an isolated island group situated in the central region of the Croatian part of the Adriatic sea, just across the cities of Zadar and Sibenik. With 150 islands, islets and rocks, in a sea area of about 320 km² (total length of the area is only 19 nm, with maximum width of 7 nautical miles), Kornati islands are the densest and the most indented archipelago in the Mediterranean Sea. 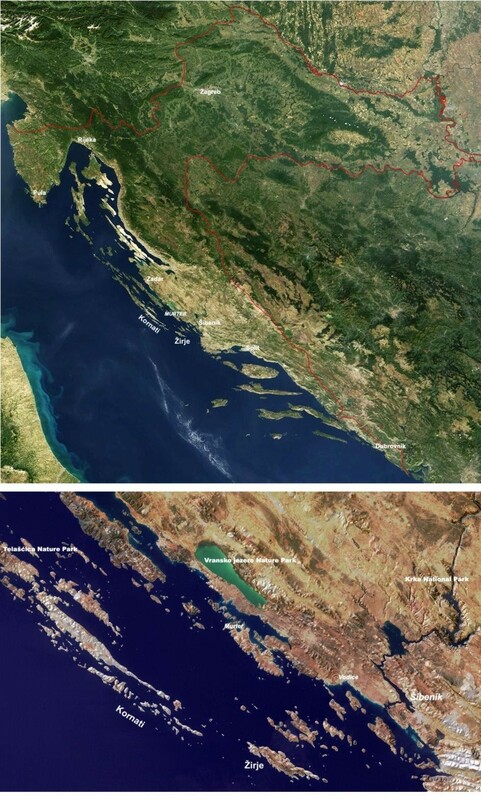 Located between island of Dugi Otok and island of Zirje, Kornati archipelago occupies only 1% of the total Croatian sea surface, but includes as many as 12% of all Croatian islands (Croatia has 1264 islands, of which 67 are populated). Because of its exceptional landscape beauty, interesting geomorphology, diversity of the coastline and especially because of the rich biocoenoses of the marine ecosystem, the southern part of the archipelago has been declared a national park in 1980. It is estimated that in the area of the Kornati islands there are around 700 to 800 plant species and the biocoenosis of the sea bottom has 352 families of diferent algae. The real assumption is that at least 2500 to 3000 families of benthic and pelagic fauna lives in the Kornati aquatorium. To illustrate diversity of marine life around Kornati islands we will mention here just few examples. This diversity of flora and fauna, intact nature and magnificients landscape attract not only excursionists and visitors but also many boaters, divers, hikers, sport fishermen and other people who love nature, from all over the world.